NOTE: Knife is not included. 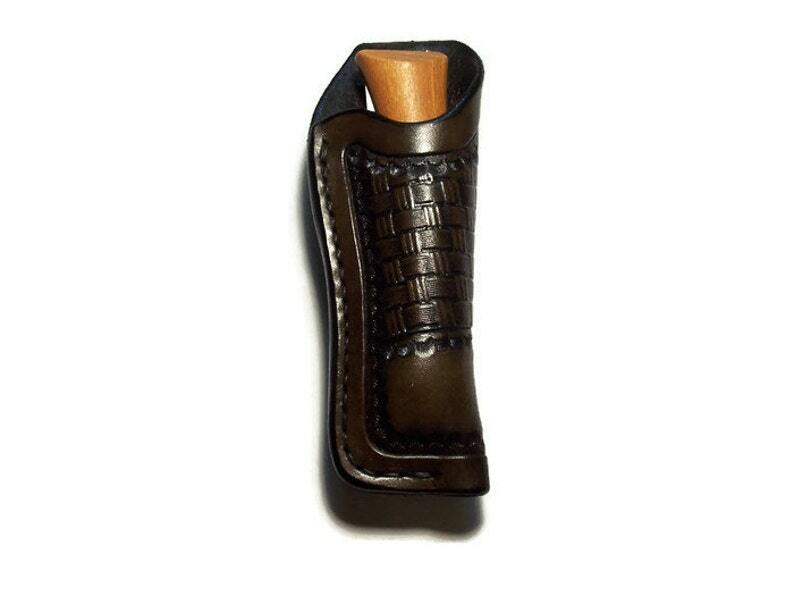 Medium Tall Custom leather knife sheath with 1 1/2' stitched belt loop. Features a hand tooled half basket weave design in Black, Chocolate Brown, Saddle Tan, Mahogany, Natural leather with natural edging, or Natural Leather with Black edging. A color chart can be found by scrolling through photo's. Fits most knives measuring 4 " to 4 1/4" Long X 1 1/8" W X 1/2" Thick OR 3/4" W x 3/4" round knives like the Opinel # 7. Sheath is custom designed and hand tooled on premium carving leather with a folded and hand stitched 1 1/2" belt loop, finished edges, and recessed hand stitching. Stitching is guaranteed for the life of the item. This item will be made as ordered at this time and ships in 7-14 business days if not in stock. Built to last! Made in the USA!